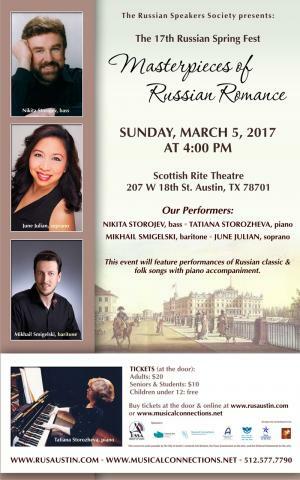 This unique musical event will take you on a romantic journey through popular Russian songs and romances. Nikita Storojev (Vocal - Bass), professor of the University of Texas, Austin, internationally acclaimed bass, soloist of Bolshoi Theater in Moscow, Russia. He will sing Russian town romances made by Peter Tchaikovsky, Sergei Rachmaninoff, A. Gurilev, accompany by Tatiana Storozheva (piano). She is a professional pianist will also play some solo pieces. In second part of concert Mikhail Smigelski (Vocal - Bariton) is known for his breathtaking voice and musical talent and June Julian (Vocal - Soprano) lyric soprano voice. Her engaging stage presence has been the highlight of many productions with the Gilbert & Sullivan Society of Austin (GSSA), as well as Spotlight on Opera (Suor Angelica, Little Women, etc. ).